The Road Star is one of the biggest, baddest air-cooled V-twins in the business. It looks good, due mostly to the classic appeal of that hardtail-looking steel frame and all the classic-looking hardware that goes with it. 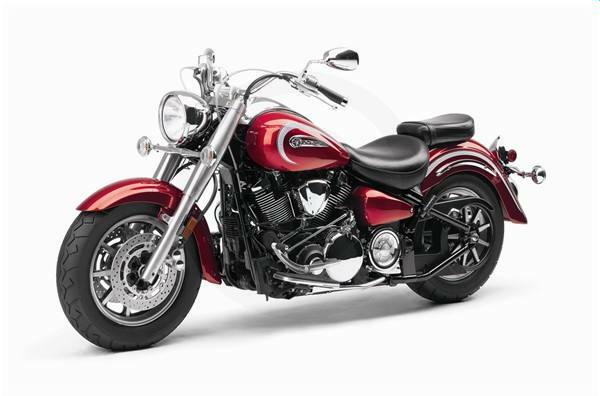 When it comes to power that fuel-injected 102-cubic-inch overhead-valve air-cooled V-twin assures the horses are never in short supply. 102-cubic-inch V-twin-powered beauty, in a long, low, hardtail-look frame, with plenty of customization potential built in. Modern engineering and materials, including ceramic composite cylinder liners. Air cooling, hydraulic valve lifters and belt ?nal drive reduce maintenance requirements to a minimum. Hydraulic valve lifters driven by twin camshafts deliver exceptional performance and less maintenance. Ceramic composite cylinder bore plating ensures greater durability and optimal heat dissipation. Electric starting system features solenoid-activated auto-decompressor for easy, dependable starting. Extra-long 66.5-inch wheelbase creates long and low retro profile, added rider comfort and well-balanced handling. Telescopic 43mm front forks with stainless steel covers and 5.5 inches of travel stylishly smooth out the bumps. 16-inch cast wheels shod with tubeless tires for a classic, yet sporty look while providing confidence-inspiring handling and excellent grip. Full-size floating-type rider floorboards are roomy and comfortable. A two-piece heel/toe shifter, and braided stainless clutch and throttle cables add even more comfort and style.